ISTiOSELIDA - Sailing ONLY: A free team-building exercise! "That was a good team building exercise!" With those words Paul Cayard, skipper of the Swedish boat Artemis summed up their Louis Vuitton Trophy race today with Britain's TEAMORIGIN, one that was more akin to a bar brawl. Packed with protest flags, incidents and flogging sails at three marks of a four-leg course, this close-fought duel went ultimately to Artemis and her helmsman Terry Hutchinson on a series of umpire calls. 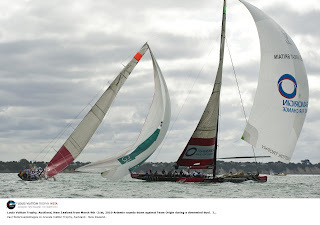 The race was one of seven packed into a long, incident-filled day of racing on Auckland’s Waitemata Harbour that that passed without breakdown, or damage to boats, sails or sailors. There was shifty breeze all day from 14 to 20 knots and ranging from the south to the southwest and Principal Race Officer Peter Reggio and his team miraculously squeezed in seven matches to complete the Round Robin. Fortunes changed as TEAMORIGIN lost two races while Artemis won two. Gavin Brady, the Kiwi skipper of Mascalzone Latino Audi was also on a roll, winning two races, including one against his Italian competition Azzurra. The racing completed the round robin, leaving Emirates Team New Zealand as the top seed, with a 6-1 record, Italy’s Mascalzone Latino Audi Team is second with 5-2. 1st seed Emirates Team New Zealand vs. 8th seed Synergy. Artemis starred in the snapshot highlight of the day as their veteran Kiwi mid-bowman David Brooke was swept overboard by a flogging jib sheet but never even got his feet wet. As the sheet hit him in the back, Brooke grabbed it and swung out over the water to be grabbed by his crewmates on the return swing. Emirates Team New Zealand def. Synergy Russian Sailing Team, 01:00 – Before the start, ETNZ’s Barker set up to the right of Karol Jablonski, on the Russian boat as they came up to the line on starboard but it was Jablonski who was bow out, and the Russians led as ETNZ tacked away. The breeze was 17 knots but shifty. Synergy, on port, led at the first cross, and pushed the Kiwis back to the right. The Russian boat led for the first two thirds of the leg but then Jablonski was slow to cover. Synergy sagged off on a big shift and the Kiwis were out of jail. Barker led around all marks, by as much as 1:53 at the second weather mark. Azzurra def. ALEPH, 01:39 – Bertrand Pacé steering the French boat ALEPH bailed out after an initial dialup and was chased by Francesco Bruni of Italy’s Azzurra team. They came back to the line with ALEPH trailing. A victory here would keep the Italians in contention for the second seed. Bruni went for the pin end at speed while Pacé tacked away to the right. The Italian skipper covered up the first leg in puffy, shifty 10-15 knot conditions but Pacé tenaciously kept it close, rounding the top mark just 12 seconds behind. ALEPH failed to make any inroads on the run and then lost a full minute on the second beat as light, puffy conditions favoured the boat on the left side. Artemis def. All4One, 00:22 – Sweden’s Artemis, with Paul Cayard as skipper and Terry Hutchinson on the wheel, seized control at the start, coming off the pin end into a big right-hand shift that boosted them to an early four boat length lead. The German/French boat All4One rounded the top mark four lengths astern but closed on the spinnaker run only lost ground getting the chute down and the jib up. Helmsman Sébastien Col sailed a good second beat and then made substantial gains on Artemis when favored by another big shift on the run to the finish but trailed by 22 seconds. Mascalzone Latino Audi def. TEAMORIGIN, 00:06 - A mano-a-mano confrontation 1 min 40 sec before the start, with both boats stalled and backing down on port, ended badly for Ben Ainslie and Britain’s TEAMORIGIN when Gavin Brady, and ML Audi were green-flagged on a British protest call. Brady sailed away to start on starboard at the committee end while Ainslie trailed, three boat lengths in his wake. The Kiwi skipper of the Italian boat opened a 32 second lead at the top mark but Ainslie kept the pressure on, whittling the margin down at every mark, and closing at the end until they were overlapped. This was the closest race of the regatta. Artemis def. TEAMORIGIN – TEAMORIGIN copped an initial penalty at the leeward mark, and cleared it, then got a flag against Artemis when Ainslie, on starboard, got inside the Swedish boat as it came into the top mark on port. 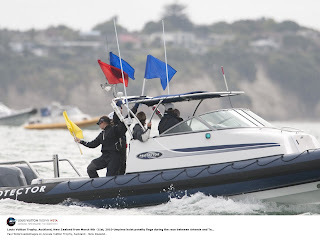 On the run Ainslie led bow to stern but Hutchinson was on TEAMORIGIN’s port quarter and an attempt by Ainslie to gybe for the finish saw Artemis rounding up as she turned to keep clear and two flags against the British plus a red, signaling an immediate penalty turn. Game over. Mascalzone Latino Audi def. Azzurra, 00:13 - In the battle of the Italian contenders, Gavin Brady, at the helm of ML Audi, hooked Azzurra on starboard before the start, forcing Francesco Bruni to split away on port. Racing was very even. Azzurra did a long board out to the port layline and led at the top mark by five seconds. Brady went on the attack on the run and a flurry of protests were green-flagged before he gybed away on port to sail through Bruni’s lee and round the bottom gate ahead. Bruni kept it close but the next two legs were Brady’s. All4One def. Synergy Russian Sailing Team – The German/French boat helmed by Frenchman Sébastien Col went into this race with the opportunity of a third seeding if they won and a sixth if they lost to the Russian boat skippered by Karol Jablonski. They earned a third seed, leading at every mark and winning by six boat lengths as the evening light faded on the Waitemata.